It is a newly renovated villa with shared pool (the pool is shared only with the owners). 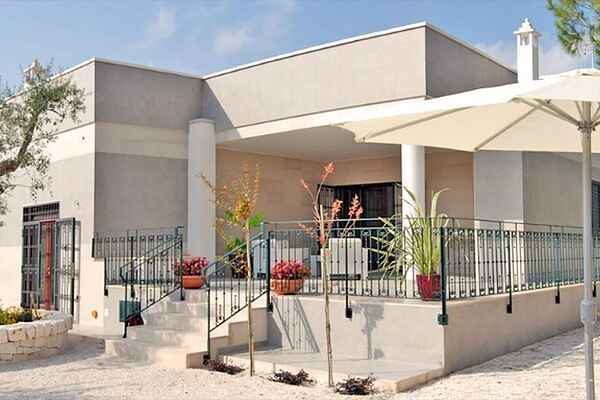 It is ideally located with scenic views of the famous hills between Monopoli and Castellana Grotte. This villa has been totally renovated by the end of February 2009. Villa has been very very well equipped with high quality and color-full furniture and brand new large and small electrical appliances. The house is standing in a very quiet area from where guests have a great view of the green hills around Monopoli. This self-catering house is immersed into the green of a large natural private park with hundreds of very ancient trees and nice fruit trees. The villa is featuring also a private pool of 10x5m that guests are allowed to use every time they like. The use of this pool is shared only with the owners (four people...) but they use the pool in rare occasions and almost never all of them at the same time! We suggest this nice villa to families with children because privacy is granted and children can play safely!